If the Nationals ever move from racing presidents, to racing supreme court justices, they’ve made a huge swing pickup. 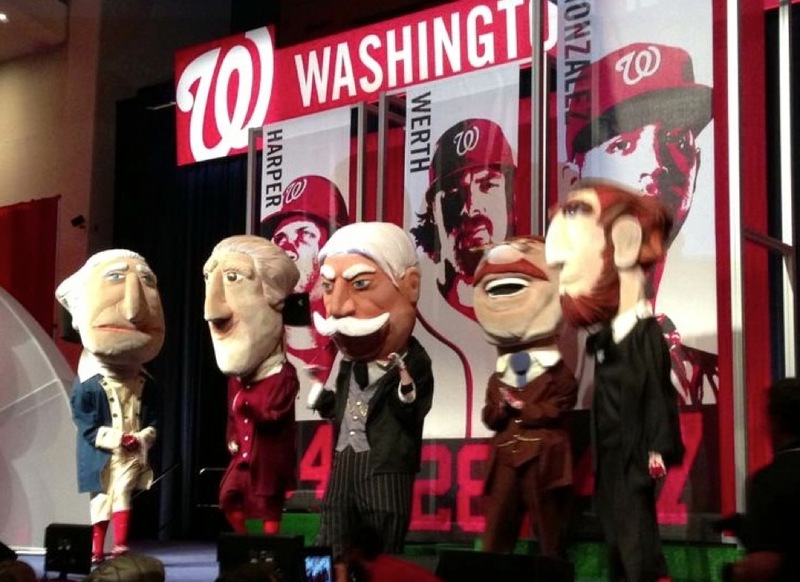 On Saturday, the Nationals unveiled their latest signing: 27th President (and 10th Supreme Court Chief Justice) William Howard Taft, unveiled before a packed hall of fans and friends at the Washington Convention Center. The singular highlight of the day-long fan fest, the addition of a fifth racing president promises to provide some interesting rivalry options for the mid-game “main event” along the warning track. In real life, Taft and Roosevelt were rivals that split the Republican Party in the 1912 election, leading to the election of Woodrow Wilson. Taft and Roosevelt split over the firing of Gifford Pinchot from the top of the Forestry Service at the USDA. A conservationist, Pinchot was canned when he opposed the Taft policies at USDA which he felt were an attempt to shutdown the conservation movement that Roosevelt had begun. Roosevelt had initially backed Taft as a good successor, but the divisions between the two men grew with the 1910 Pinchot-Ballinger affair, and then the 1912 prosecution of U.S. Steel split the party in half. Roosevelt would best Taft, but neither could assemble a majority. The rift that followed split the Republican party, formed the Bullmoose Party, and sunk the reelection chances for President Taft. Nine years after the electoral disaster, Taft would accept President Harding’s nomination to the Supreme Court as Chief Justice, where he was approved 60-4 by the Senate. Taft would push for the Supreme Court to get their own office space – a building immediately recognizable to all DC residents – instead of using the old Senate Chamber in the Capitol. In addition, he would reorganize their docketing structure to give the court more flexibility in modern scheduling and control. Taft wouldn’t live to see the new Supreme Court building built, though, as he would pass on in 1930. He is buried at Arlington Cemetery, one of two presidents to bear that honor, and one of four chief justices. Oh – and just to cut one off at the pass – Taft is not the inventor of the Seventh Inning Stretch, despite the anecdote of a seventh inning stretch inspired by Taft’s restless attendance at a Senators game, the practice predates his term by 50 years. At NatsFest, the fans showed the love for Teddy, so I think Taft is headed for the villain role should he knock Teddy down. Racing Presidents is fun and adding Taft, the last President to have facial hair (not counting five o’clock shadows), is a brilliant idea by the Nats.